You can mark content with a surrogate key and use it to purge groups of specific URLs at once without purging everything, or purging each URL singularly. 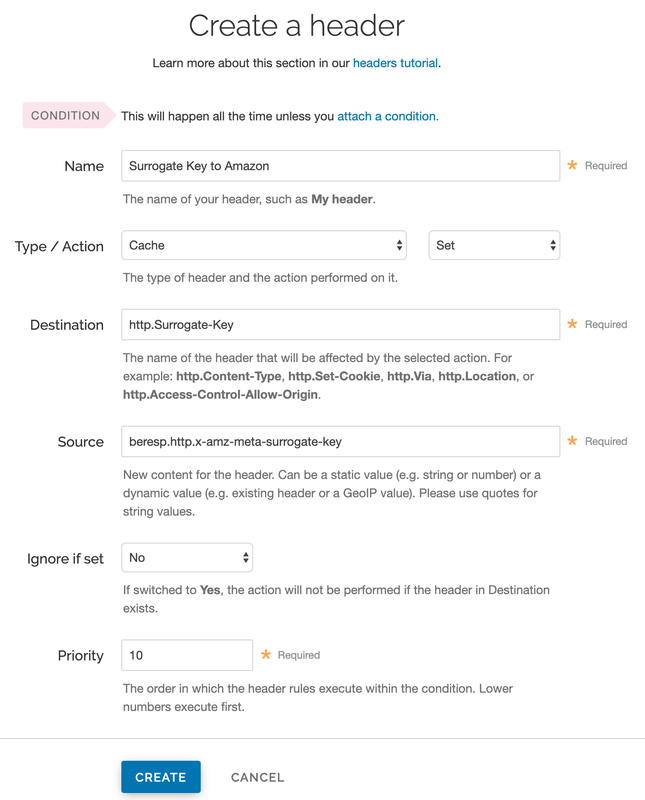 On the Amazon S3 side, you can use the x-amz-meta-surrogate-key header to mark your content as you see fit, and then on the Fastly side set up a Header configuration to translate the S3 information into the header we look for. IMPORTANT: Pay close attention to the capitalization. Amazon S3 only accepts all lowercase header names. In the Name field, type a human-readable name for the header. This name is displayed in the Fastly web interface. In the Source field, type beresp.http.x-amz-meta-surrogate-key. Click the Create button to create your header. NOTE: There are several limitations to surrogate keys. See the surrogate key limitations section for more information.